I wanted to say goodbye to San Jose. I’m moving to Los Angeles next week. I’m excited for that – regular access to Phillipe’s, to Original Tommy’s, to Canter’s. In my head I’m already there, but I don’t want to get ahead of myself. I owe San Jose something, and I hope I have done it justice. I could have gone around and revisited favorite sandwiches, but that didn’t feel like a fitting tribute. What did feel like a fitting tribute was to sit down to new sandwiches, because that’s what San Jose has always offered. Phat Tri charges $4 for the above bánh mì, which would be steep for the east side if the above picture weren’t merely half of the sandwich. The thing is a monster, bigger than your forearm. There’s no quantity-for-quality switch going on either, this is a fine sandwich. Quality bread, fresh veggies, the meat is tender and has a strong garlic/lemongrass/soy savory quality to it. There are a dozen of these sorts of shops in San Jose, places that are always mentioned in the never-ending best bánh mì discussion. I noticed Thien Huong while eating at Phat Tri. The had a “Grand Opening” sign out front, and I figured anyone with the guts to open across the street from a place with Phat Tri’s reputation had to have a lot of faith that their sandwich was something special. I don’t know if that’s what Thien Huong thinks about their sandwiches, but it should be. The meat here was piping hot, freshly seared and bursting with the sweet & salty notes of the classic thịt nướng marinade. For every place like Phat Tri, with a reputation and a leigion of devotees, there are a dozen places like Thein Huong. They’re upstarts, latecomers to a crowded market, people with something to prove. Some of them back it up, some of them don’t. They come and go, becoming almost haunting. Maybe the next one is better than this one. You won’t know until you’ve tried it. Aroma Coffe & Snacks is three and a half miles from the other two establishments. That wouldn’t be so far, if the distance weren’t stuffed with more sandwich shops. Aroma is tucked in to the back half of a shopping center that sits perpendicular to the street, it’s a little tough to see even when you’re looking for it. Seeking it out is worth the effort. Their thịt nướng is deeply caramelized, chewy and full of flavor. For every Thien Huong, there are another handful of Aroma Coffee & Snacks. Great sandwiches that leave you unsettled over how good the sandwiches might be at all the places you haven’t made the time to try. 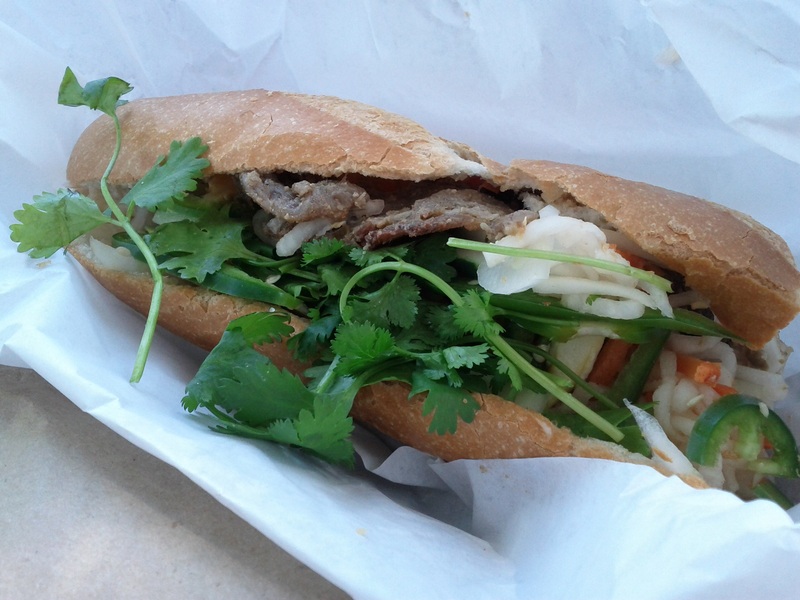 I’ll be able to get a bánh mì in Los Angeles, but it won’t be like this. I could go try a new sandwich every weekend for a year and I wouldn’t have to double back. Most of them would be pretty good. 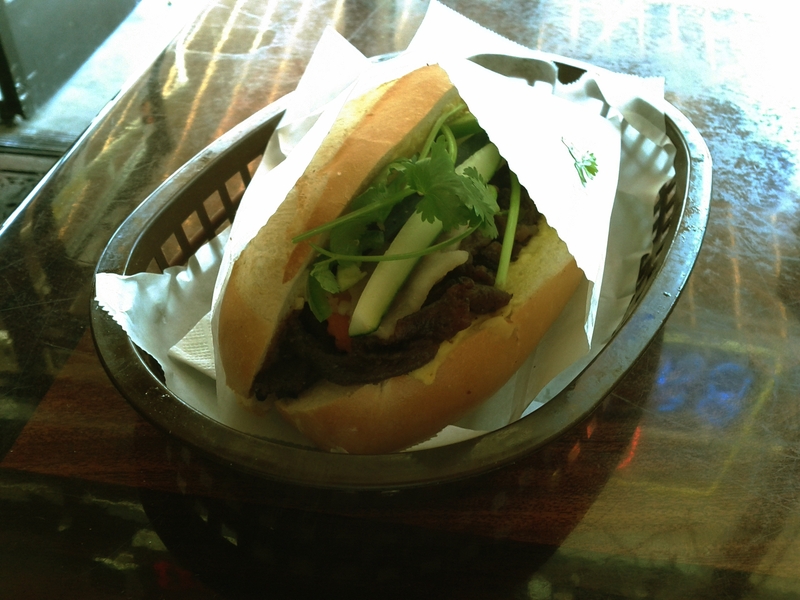 The bánh mì is going places, and some day it will be widely popular and too big to really get a head around. When that happens, I’ll remember a city that did its damnedest to give a wonderful sandwich everything it deserved. Thanks for all the sandwiches, San Jose. 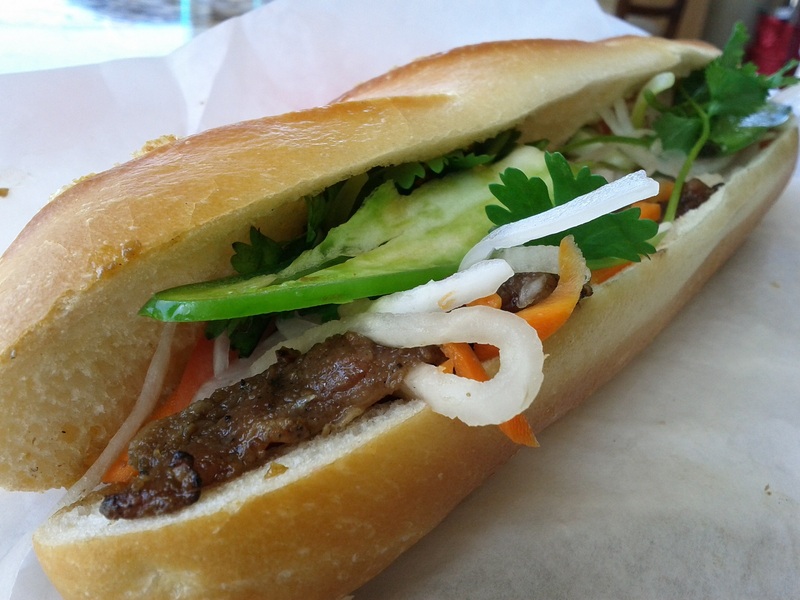 This entry was posted in Sandwich Reviews and tagged Banh Mi, Pork, Reviews by Pete, San Jose, Sandwiches I Have Eaten, Sandwiches Made For Me by Pete. Bookmark the permalink. If I can make a suggestion for your new life of sandwich-hunting in LA, please try the turkey sandwich at Mateo’s (three locations, my favorite is at 4929 S. Sepulveda Blvd.). It’s an ice cream place, but they make the best sandwich I had in two years in LA, Canter’s and Cole’s included. Their smoothies and ice cream are also outstanding. As an appreciator of the sandwich-making craft, I think you’ll be duly impressed. Happy eating. I appreciate the tip! It is on the list.